Cyber-Sportz to provide the ultimate console video game attraction for any event. We proudly use official Sony Playstation, Xbox 360 and Nintendo Wii products and 32" HDTV's to give our clients the most electrifying gaming experience possible. Imagine rows of your favorite video games. 3 Monkeys can put them any where for your party or event, however we suggest you use them under a tent or inside location to reduce glare. With our rolling 32" video game carts, we can provide up to eight large high definition screens for video game play. Each screen is optimal for one or two players. Nintendo Wii Games - Popular Wii video game system where players can really get into the game. Guitar Hero or Rock Band - Musical performance games sound and look great at your party. 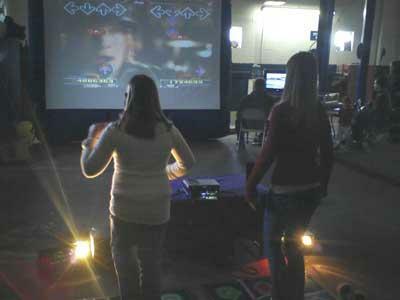 Dance Dance Revolution - One of the most popular games ever is available to jam out at for your party or event. Competitive Karaoke - Sing your way through the hits, challenging your friends along the way. Xtreme Racing Simulator 2.0 - Xtreme Racing is our formula one video game simulator. Bigger is always better! With 3 Monkeys, you can blow up any of your favorite games like Wii, Guitar Hero or Rock Band on giant 10'x12' inflatable screens. Players will enjoy a giant life-size experience that can't be recreated at home. Inflatable screens require 10' or higher ceiling clearance. Games need to be set back further from the player, as well. It's recommended that you have at least 15 feet of space between the players and the game. 3 Monkeys can set up to 4 Max Size screens for your event. Have us set up the 3 Monkeys Inflatables Mobile Arcade to supply a wide variety of games spanning every genre. Whatever your gaming needs, 3 Monkeys Inflatables & Entertainment can take it to the next level! NBA,NFL, NASCAR, NHL, NCAA football and basketball are all available to play along with the latest and greatest action-adventure, puzzle, driving and kids games. We limit selection to games that are rated E for Everyone through T for Teen so you are can be certain that not only will every game be appropriate but every one is going to be thoroughly entertained!